Pinto beans are rich in fiber and protein, and at just 143 calories per half-cup serving they make a healthy main ingredient for meals. Pair pinto beans with brown rice and steamed or lightly sauteed vegetables, or fold them into soft-shell tacos with low-fat cheese, salsa and shredded cabbage. Just watch out for high-calorie toppings like sour cream or full-fat cheese, and go easy on the oil for refried beans to keep the calorie count low. 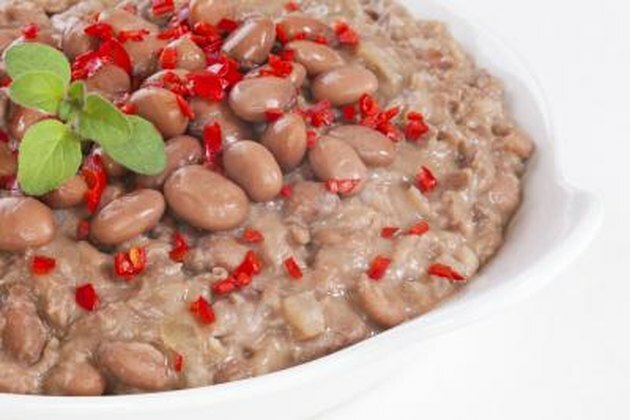 Pinto beans are on the Medline Plus list of healthy proteins to eat for successful weight management. Not only are the legumes low in fat -- which is more calorie-dense than carbohydrates or protein -- but each 1/2-cup serving contains nearly 8 grams of fiber, significantly contributing to the recommended daily allowance for adults of 20 to 35 grams. Fiber is bulky but contains no calories, allowing you to fill up without compromising your waistline. Just be wary of serving sizes; eating too much of a good thing will still lead to weight gain.